In the past year, I feel as though I have become the kind of person who is afraid to read series finales. I mean, who wants to devote their time and feels to a series just to be disappointed by the ending? However, this year I decided to challenge myself and finish series that I had previously started. Luckily, Chaos, the final book in the Guards of the Shadowlands trilogy, came through and did not disappoint me. There is absolutely no way to talk about the plot of Chaos without spoiling the previous books in the series, so I will not. What I will say is that Sarah Fine did a phenomenal job of creating a story that wrapped up all the lose ends while balancing the heartbreak and happiness. One thing I always love about Sarah Fine's writing is how amazing her characters are. Chaos essentially follows all the same characters as the two prior books but there are a few additions to the finale that added even more interest to the story. Considering the situations these characters went through, they still felt extraordinarily real and relatable. Overall, I could not have asked for a better finale to the Guards of the Shadowlands trilogy. 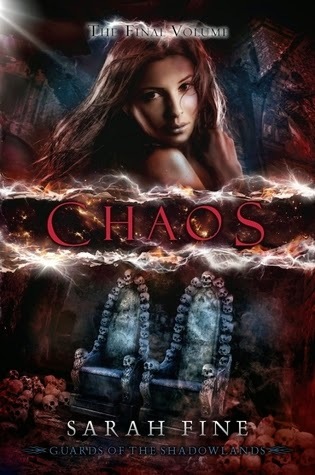 Chaos was extremely satisfying and incredible like all the other books in the series. I highly recommend this series and I can't wait to continue reading Sarah Fine's work in the future! How do you feel about reading series finales? 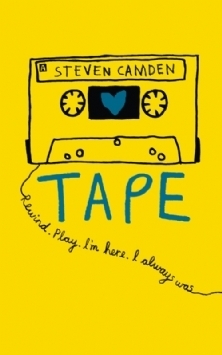 I picked up Tape as an ARC at BEA 2014, which was almost a year ago so it hasn't been an ARC since it's publication in September, which is why it fulfilled the requirement to be chosen as "an old ARC you never got to" for my January pick from my TBR Jar. Yes, I know it's April. I know I'm behind. Judge me all you want, this is the most stressed I've ever been in my life and now I have to deal with looking for internships and moving and -- okay, I'm going to save the ranting about my life for Life of a Blogger posts. Okay, we're getting off track here (okay, I'm getting off track here), there is a two star rating that needs to be addressed. This book could have been so much. Just look at that cover. It's beautiful enough to be my February TBR (read a book solely judging by its cover). And the blurb promises a story of "two teenagers separated by time but infinitely connected." A story that "to really get it, you just have to read it." Well, I read it, and there are parts I still don't get. Like the tape itself. For some background, Ryan and Ameliah are our two main characters and the story alternates between their storylines, Ryan's in the 90's, Ameliah's in the present day. Ameliah has found, in her attic, a stash of old audio tapes, many of which are static, but some of which relay the voice of a boy sometimes saying her mom's name and telling her stories. Ryan, meanwhile, is often found recording tapes for his mom, but also sometimes for other purposes. There comes a point in which they both say something into their respective cassette playing devices and they end up being able to hear the other. Woah, weird, right? Twenty year gap, but this is happening, and I can totally roll with it because hey this is a book, and books have magic or science fiction or weird happenings all the time. Except it literally never happens again until the like the last two pages and it's never addressed and it doesn't have any bearing on the plot whatsoever. And the entire rest of this book is set in reality with no magic or time travel or anything that isn't realistic fiction and it just irritates me so much that there are these three pages in the whole book that have these useless scenes that I could honestly rip out and nothing would be lost upon the next reader (I won't do that I can't damage books it's against my moral code). What was the purpose of that????? If you were going to make that a thing, why didn't they talk to each other regularly, or find out some deep intricate plot secrets from one another, or I don't know, this could have gone so many ways. Honestly, it should have just been taken out, it seemed thrown in as an afterthought but it so clearly wasn't. However, that's not my only issue with the book. The beginning was just so hard to get through. And by beginning I mean like the first half. I keep saying it took me so long to read it because I haven't had time but I think it's also very much because even when I did have time this book was so dry that after a few pages I would just put it down and do something else. The writing was just so monotonous and boring and everything was described in weird ways. It wasn't too detailed or anything, it just wasn't memorable writing, I honestly can't remember anything except for the fact that he overused the phrase "he/she puffed out his/her" cheeks" way too much and started to bother me so much I would get genuinely angry when I saw it. What does that even mean? I tried puffing out my cheeks and it does not express any of the emotions the characters are showing when they are doing that, which is every emotion because he uses it when they're confused, frustrated, happy, sad, upset, curious, thinking, talking, deliberating, anything really. I tried reconciling it in my head by imagining them like blowing air out their mouths but kindof through their cheeks if you can picture that but that connotes frustration so it wasn't applicable everywhere but it got me through. Anyway, the first half was spent mostly just introducing the characters and talking about their lives and it was honestly just, like I already mentioned, dry and not fun to read, and I could feel myself waiting for the stories to connect so I could find something to be interested in or at least want to follow. I don't know why it took so long, there are only like three and a half characters probably. But so much time was spent on irrelevant things and it felt like it moved so slow and nothing really happened. By the time things picked up, I had already figured out the big reveal (it wasn't hard you probably already know) and even the twist at the end with Joe wasn't hard considering there were one of two possibilities for him. The characters for the most part felt dull but they had their moments (not enough moments to warrant more than two stars). Ryan and Eve felt kinda insta-love but it wasn't too too bad where I'd harp on it like I can see where it can also be kinda "13 year old boy sees 13 year old girl and they think the other is cute and then they talk and they're like wow we are in love" because that's how kids are I just remember 13 year olds being not very forthright about this stuff but what do I know I'm like an old lady (no I'm not I'm 12) and also it's a book who cares. You know who was definitely insta-love? This might be a spoiler, so like, avert your eyes? Ameliah and that supermarket boy. What was that? So cheesy and lame and I'm all for cheesy and lame all the time. Spoiler over by the way. Anyway, speaking of Ameliah, she felt like a shell of a character, and so did Heather, like they both had stock personalities with nothing built upon that. Those aren't characters I enjoy reading. Ryan and Nathan were pretty cliched as well and their development happened too abruptly but I liked that it happened and I liked their stories more than Ameliah's up until the end when she started learning about what happened. Overall, the book was kindof a mess and there are definitely more things I could pick on but if this gets too long no one will read it. Also, the last thing I want to comment on is I suppose a personal problem but I just really did not like the formatting of the book at all. My biggest problem was that none of the dialogue (which, by the way, was dry and boring and forced) was in quotes! Instead, there were just em dashes ( -- ) used to signify someone was speaking but there was no "he said" or "she said" or like labeling or person talking so you just had to figure out who was talking and sometimes in a conversation someone got two em dashes in a row or three and it was just???????? Also, more minor than that, I didn't like the typeface chosen for neither Ryan nor Ameliah's parts and I didn't like how they looked next to each other. I thought they very much clashed. Like this book did with my brain. If any of you read my stuffed animal saturday (linked above) this past January and accidentally purchased this book based on my analysis of the first three pages, I AM SO SORRY. Again, like many books, it sadly has only a nice cover and very little else to offer. I also got this book at BEA 2014 and like Noor school and classes and internships and things are literally the realest struggle. Okay so it has been well established that one of my least favorite things are static characters, which Noor touched upon above. Our homegirl Ameliah literally has the most static stock personality of all time, and none of the supporting characters are much better. Like actually, from the blurb if nothing else, I expected some quirky traits to signify the difference in time but no not even that was given to us. Again, S I G H. Also there is instalove which happens with both the main characters (Ameliah and Ryan) on two different occasions so like ???????? if it /absolutely/ has to happen once I guesssss that's maybe understandable (not really but better than doing it twice). Okay so like even if we ignore all of my preferences about books and characters such as non-stereotypical/cliched/static characters and instalove and really awkward mushy I-tried-to-sound-like-a-middle-schooler-in-love-but-failed language, we literally cannot ignore the plot. First things first, the tape was like almost completely irrelevant to the story, which Noor touched on above. Honestly if the book wasn't named tape they could have easily changed this any which way and had the plot really not deviate from where it already is at all -- this should be a sign that the book in question cannot be good, because changing the (what is implied to be) central plot point of the story and still having the same story is just ???????no. Because of this, the actual story was a little annoying to follow because I have no idea how this tape playing at the same time worked -- because everything else was so realistic I was like ????? is just just magic should I just accept this or will there be more and just overall it was just really poorly explained. If there is going to be a magic aspect to the book at least explain it, and also that might have made the tape part a little more necessary to the plot. Also, Noor said this, but the layout of the book was just kind of ugly for me, in that there are no quotes but dashes instead, making it really hard for me to read through and know who was talking at all times. Also the dual point of view was a little awk in this just because it'd be one chapter with two points of view and sometimes I'd forget who we had switched to and the lack of quotes and indication of who's talking did not help. All in all, good cover, but I vote no on the plot. P.S. Tape is super predictable like super super predictable like I'm almost 100% sure you guessed what the connection between Ryan and Ameliah is from the blurb or review or the first part of the book. Have you ever made anyone a mix tape? 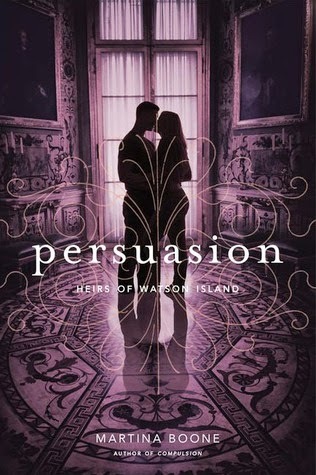 This week I'm waiting on Persuasion by Martina Boone! I read Compulsion over my spring break and I was absolutely blown away by how incredible it was. I thoroughly enjoyed every bit of Compulsion - the concept, the plot, the characters, the setting - everything was just magical! It was even better than I could have ever imagined and I cannot wait to see what happens in the next book! 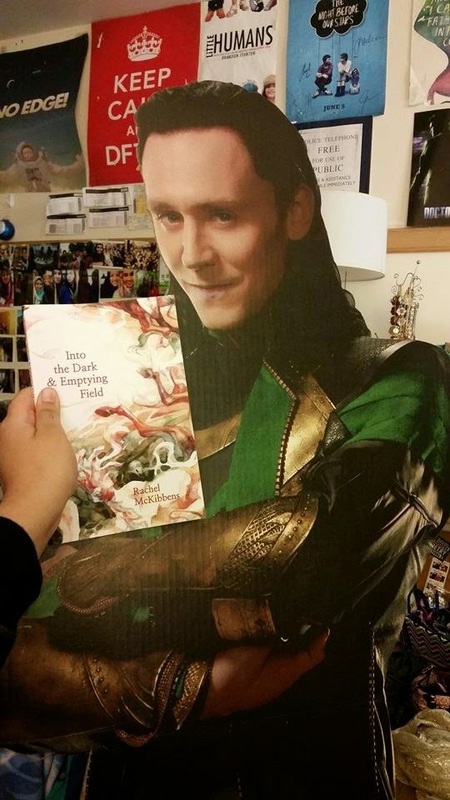 So far: Loki, who grew up with royalty and has high tastes, loves poetry, much like this one English actor, Tom Hiddleston, who looks quite like him. Therefore, he was delighted to find that I chose a poetry book for us to read (I know, I just reviewed one recently, what can I say, I have a type) and loves all the poetry inside because it chills him to his bone, which he knew it would because he's familiar with Rachel McKibben's work and bought the book because she's so great. how they chimed as she stacked them in the drawer. the waiting sound right before the phone rang. each page of the morning paper. Now I only really miss the sound of my own voice. a gold skinned woman in a gown of honey bees pinning love notes to the bottom of the sea. Not only was this stanza great but Loki and I thought the whole poem was absolutely beautiful but we have to keep some element of mystery, don't we? I just want to preface this by saying that I live for those hit-you-right-in-the-gut quotes and picking my five absolute favorite inspiring quotes from books is definitely an impossible task because of all the books and all the quotes I hold near and dear to my heart, so this list is less of a "these are my five favorite ones above everything else" and more of a "these five are really awesome quotes that I really love among all the other ones I really love." "We've all got both light and dark inside us. What matters is the part we choose to act on. That's who we really are." from Harry Potter and The Order of The Phoenix by JK Rowling - I figured I'd start out with a good old Harry Potter quote because you can never have enough Harry Potter and it's just such a huge part of my life that the messages in the book have stayed with me my whole life. This particular quote is one of my favorites for a few reason. One is that it came from the mouth of Sirius Black, who is one of my absolute favorite characters. He's legitimately my second favorite character, only a smidgen below Luna Lovegood (the tiniest microscopic smidgen) and so I hang on to his lines anyway, but I just like the message behind it in general because I think it's very true, especially when you're older, that everyone has good parts and bad parts and negative thoughts but the important thing is what you make yourself. "Fairy tales are more than true: not because they tell us that dragons exist, but because they tell us that dragons can be beaten.”" from Coraline by Neil Gaiman - So as I've definitely mentioned before, Neil Gaiman is my favorite author and as far as I can recall, my first encounter of his writing was when I read Coraline in fourth grade and totally loved it. This is a quote that's stuck out to me as I've reread the book because it provides such an interesting take on the concept of why people love fairy tales and how the whimsical nature of them isn't the only important part, but it's important to see how they all show that even the toughest battles can be overcome. I find it a very comforting sentiment. "It may be unfair, but what happens in a few days, sometimes even a single day, can change the course of a whole lifetime..." from The Kite Runner by Khaled Hosseini - If you haven't read this book or any of his other books, please get on it ASAP, because Khaled Hosseini's writing is full of such beautiful wording and imagery and overall command of language. Also, his books will make you cry. A lot. Most quotes from them are less "inspiring" and more sad, but beautiful nonetheless, but I particularly liked this one because it embodies the idea that the direction your life is heading in isn't set in stone, a few choices could change a lot, even though it might not seem like it at first. It's an idea I definitely need to remind myself of pretty often. "Holding Eleanor's hand was like holding a butterfly. Or a heartbeat. Like holding something complete, and completely alive" from Eleanor and Park by Rainbow Rowell - I think Rainbow Rowell has such a way with words and it comes out the most eloquently in Eleanor and Park. This whole book is full of beautifully turned phrases and I particularly liked this one because it was a unique way of describing a not-so-unique action. "“You don’t forget the face of the person who was your last hope.” " from The Hunger Games by Suzanne Collins - Even though THG is one of the most quotable series, I picked this shorter, still poignant quote for this post because I feel like it really hits hard and a lot of people can relate to it. Preface: Ditto @ Noor, but also: I really believe that every solid piece of literature (fiction), like every single one that I'd read again or made me feel something has "the line." The line can be just one quote in the book, or there can be multiple, but it is necessary for each good work of literature to have at least one line that stops you in your tracks and demands a reread and a sigh at how truly beautiful/encompassing/what-have-you it is. That being said, some of these quotes below are the line, but some will just be some hella rad quotes that I just happen to really like. "It is our choices Harry, that show who we truly are, far more than our abilities." from Harry Potter and the Chamber of Secrets by J.K. Rowling - following suit with Noor, I thought I'd start with a Harry Potter quote as well. This is probably one of my favorite quotes from the series, although there are literally hundreds of the lines spread across the seven books. Dumbledore is talking to Harry when this quote is said, and it really centers Harry, and sometimes you just need someone to remind you that who you are is chosen solely by you. "I felt wise and cynical as all hell" from The Bell Jar by Sylvia Plath - This is one of my favorite books of all time and so many of the quotes from it just spoke to me (I read this in my formative year of 9th grade, when I felt so pretentious and superior for absolutely no reason and this book really anchored me and made me realize that I'd only ever change if I was honest with myself). This quote was the beginning of that. "She was the noor of my eyes and the sultan of my heart" from A Thousand Splendid Suns by Khaled Hosseini - LOL shout out to my friend Noor for being the light of my eyes and the sultan of my heart. You are the real bae. Really though, this author and this book and everything this man has ever written is just riddled with perfect lines and quotable moments. But I chose this one because I love Noor lots and I thought I'd take this moment to remind her that she's hella rad and she's totally in charge of my heart. "Angry people are not always wise" from Pride and Prejudice by Jane Austen - This quote seriously should be printed somewhere where I can always see it. I tend to make rash decisions when I'm angry, mostly I just get super abrasive and confrontational but after some time the anger ebbs away and I return to being a rational human. This quote is not only from one of my favorite books, but should also be the one thing I get tattooed on my hand or something so I have to see it all the time. "Stay gold Ponyboy, stay gold" from The Outsiders by S.E. Hinton - I think I say "stay gold" enough in my real life for this to be relevant in this post. It says a lot with so little and I really admire that. What book quotes inspire you?